Ward-Beck's AES67/ST2110 networked audio equipment will be demonstrated in action at the IP Showcase, at the upcoming IBC 2018 convention. This year's IBC will be held in RAI Amsterdam from September 13th to 18th, 2018. Among the equipment that we will demonstrate at the convention, is our newly-released PreMO-222. The PreMo-222 is a dual mic/line pre-amplifier with PoE capability. It is AES67 and ST2110 compliant. PreMo-222 is perfect for talk show radio, reporters on the go, live-casting, live sports commentary from the stadium, and many other such applications. It was most recently used by CTV to record ambient audience sounds at the 2018 iHeartRadio MMVAs awards show held in Toronto. Below is a photo of the PreMo-222 setup at the iHeartRadio MMVAs. Out of two racks, we managed to do the entire ambient audience recording for an internationally watched awards show. The IP Showcase at IBC 2018 will be in Conference Room E106. Make sure you stop by there and see our equipment in action! This isn't Ward-Beck's first rodeo. Here are some pictures of Ward-Beck equipment on demo at previous IP Showcases, both at IBC and the NAB Show. Ward-Beck Systems showcasing the preMO, 32ME and AMS2 at the NAB 2017 IP showcase. Confirming SMPTE ST2110 interoperability with many manufactures. 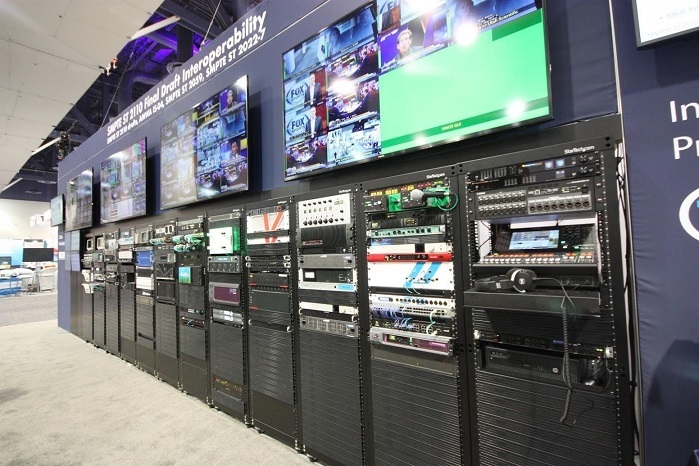 Ward-Beck PreMo-222 on display at NAB 2018. This entry was posted in AES67, AoIP, IP Showcase, News, preMO and tagged st2110, ibc, ibc 2018, IP Showcase, premo-222, aes67, aoip on September 6, 2018 by sangavai.